When most Americans hear the word "Tet," they immediately recall learning about the 1968 Tet Offensive during the Vietnam War. But what is Tet? 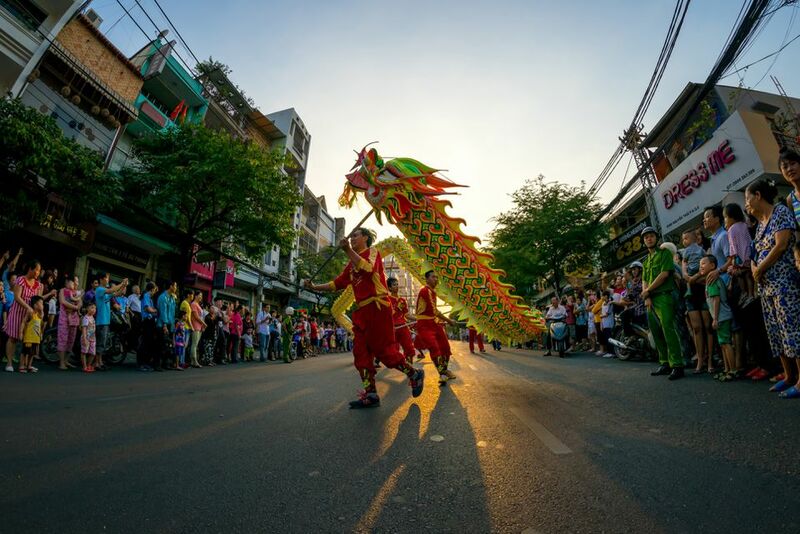 Considered the first day of spring and most important of national holidays in Vietnam, Tet is the annual Vietnamese New Year celebration, coinciding with the Lunar New Year celebrated throughout the world in January or February. Technically, "Tet" is a shortened (thank goodness!) form of Tết Nguyên Đán, a way to say "Lunar New Year" in Vietnamese. Although Tet can be a very exciting time to travel in Vietnam, it's also the busiest time of the year to be there. Millions of people will be traveling through the country to share reunions with friends and family. The holiday will certainly have an impact on your trip plans. Tet is seen as a chance for a fresh start. Debts are settled, old grievances are forgiven, and houses are cleaned of clutter — all to set the stage for attracting as much luck and good fortune as possible in the upcoming year. Because many shops and businesses will be closed during the actual Tet holiday, people rush out in the weeks prior to take care of preparations. They purchase gifts, groceries, and new clothing. Many meals will need to be cooked for family reunions. Markets and shopping areas become busier and busier. Hotels get booked. Locals often become more congenial and outgoing during Tet. Spirits lift, and the atmosphere becomes optimistic. A greater focus is put on the ability to invite good fortune into homes and businesses in the upcoming year. Whatever happens on the first day of the new year is thought to set the pace for the rest of the year. Superstition abounds! For travelers in Vietnam, Tet can seem incredibly noisy and chaotic as people celebrate in the streets by throwing firecrackers and banging gongs — or other noisy objects — to scare away evil spirits that could bring bad fortune. Any hotel rooms with windows facing the street will be extra noisy during the celebration. Tet is a great time to see Vietnamese traditions, games, and revelry. Public stages are set up throughout the country with free cultural shows, music, and entertainment. In the popular Pham Ngu Lao area in Saigon, special performances will be held for tourists. Much like during Chinese New Year, there will be dragon dances and lion dances. Many Vietnamese people return to their home villages and families during Tet; transportation becomes filled up in the days before and after the holiday. Plan extra time if you'll be wanting to move around the country. Many businesses close in observance of the national holiday, and other places slow down with fewer staff on hand. Many Vietnamese families take advantage of the national holiday by traveling to tourist areas to celebrate and enjoy time away from work. Popular beach areas and tourist towns such as Hoi An will be busier with more sightseers than usual. Book ahead: fewer hotels will be available and accommodation prices increase sharply with demand in central areas. While Chinese New Year is observed for 15 days, Tet is typically celebrated for three days with some traditions observed for up to a week. The first day of Tet is usually spent with immediate family, the second day is for visiting friends, and the third day is dedicated to teachers and visiting temples. Because the principle goal is to attract good fortune for the new year, Tet and Chinese New Year share a lot of similar traditions. For instance, you shouldn't sweep during Tet because you could inadvertently sweep away new luck. The same goes for any cutting: don't cut your hair or fingernails during the holiday! One of the most important traditions observed during Tet is the emphasis put on who is the first to enter a house in the new year. The first person brings the luck (good or bad) for the year! The head of the house — or someone considered successful — leaves and returns a few minutes after midnight just to ensure they are the first to come in. Like Thai and Chinese, Vietnamese is a tonal language, making pronunciation a challenge for English speakers. Regardless, locals will understand your attempts through context. You can wish people a happy new year in Vietnamese by telling them "chúc mừng năm mới." Pronounced roughly as it is transliterated, the greeting sounds like "chook moong nahm moi." Like many winter holidays in Asia, Tet is based on the Chinese lunisolar calendar. The date changes annually for Lunar New Year, but it usually falls in late January or early February. The first day of the new lunar year occurs on the new moon between January 21 and February 20. Hanoi is one hour behind Beijing, so some years the official start of Tet varies from Chinese New Year by a single day. Otherwise, you can just assume the two holidays coincide.